Ride Don’t Hide is a nationwide fundraising bike ride that brings mental health out into the open. Join us for the eighth annual Ride Don’t Hide on June 23, 2019, in over 25 communities across Canada. Ride Don’t Hide is the largest mental health bike ride in Canada with almost 10,000 riders and hundreds more family members, friends and volunteers across Canada taking part, raising more than $2 million each year for the Canadian Mental Health Association. Get on your bike and join the movement. Ride. Don’t hide. This community event accommodates riders of all ages with routes for kids and families, the seasonal rider as well as the more experienced cyclist. Also new this year, Stride Don’t Hide - no bike needed just put on your sneakers to walk and join us as we come together to get loud about mental health. Riders can register as individuals, families or teams. A new addition this year. Don’t have a bike? Prefer to walk? Stride Don’t Hide is for you. You have the option of two routes: a 4km route that takes you up the first hill of Knox Mountain to the path next to Royal View Drive, you will descend and connect to Gordon Drive and then take the Rail Trail back to the start; or a 6km route that takes you up to the Paul’s Tomb trail where you’ll connect with the Poplar Point loop and descend lakeside back to the start. Click here to see the 4km walking route. Click here to see the 6km walking route. This kids and family route takes riders along the Rail Trail from the Curling Club to Spall Road and back again. There will be a fun and interactive pit stop with refreshments provided at the turn around point. Click here to see the 6km Kids & Family route. The Okanagan Rail Trail is the setting for this route. You’ll head out along the trail and then take advantage of the Bulman Road Multi-use Pathway for a quick stint on John Hindle Drive near UBCO. Then it’s along the newly paved Academy Way to loop you back around and eventually to Royal View Drive where you will have a speedy descent through Knox Mountain Park and back to the start. Click here to see the 25km route. This route, for the more advanced rider, takes you along the entire Okanagan Rail Trail just past the Kelowna Airport. As you loop back you’ll take Old Vernon Road, Rutland Road and Hollywood Road into Southeast Kelowna then it’s a straight shot along Richter Street to lead you back to the start. A pit stop with bathrooms and refreshments will be provided along this route at roughly the halfway point (location TBD). Don’t know if you can do the full 50km? No worries, route markings to accommodate a 40km ride will be provided along the way. Click here to see the 50km route. Sign up to be a part of Budd’s 100 today and decide which route is right for you later! When you join Budd’s 100, you agree to raise $100 for CMHA Kelowna and your $40 registration fee is automatically waived. PLUS, thanks to the generosity of the Thomas Alan Budd Foundation, when you select this option your $100 in fundraising will be matched AND thank you to BNA Brewing Co. who has come on board to match an additional $25. That’s $125 in matching donations for everyone who signs up for Budd’s 100! The 2018 Ride Don’t Hide event raised $1.7M for vital mental health programs and initiatives. This could not have happened without the support of thousands of Canadians who participated from coast to coast. Through their efforts, in their communities and workplaces, they helped raise awareness about mental health and the need to eliminate the stigma associated with mental illness. No matter how old or how young, CMHA Kelowna provides support for families and individuals through programs that promote positive mental health and support recovery, while championing the elimination of barriers that can prevent people from thriving. Last year, the branch connected more than 20,000 individuals with information, support and services. Every donation we receive helps to endorse our commitment to continue to provide quality mental health education to individuals, families and our communities. At CMHA Kelowna we want to let anyone struggling in silence to know they are not alone. Ride Don’t Hide is a rallying point for us all: Anyone can experience poor emotional or mental health. Anyone can be at risk for thoughts of suicide. No one should have to hide or stay silent. On June 23, join us and ride in plain sight to raise funds for programs in services in our community. 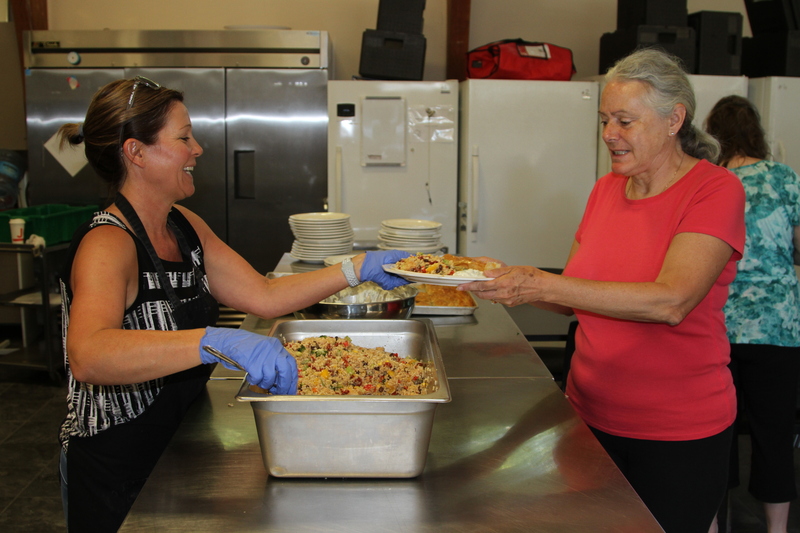 Mandy, CMHA Kelowna WDC Chef (left) Barb, CMHA Kelowna WDC peer supporter (right). If you have any questions regarding Ride Don't Hide in your community please contact your local participating CMHA branch.